Allison Palm is graduate student earning her Master’s degree in Public Administration and Nonprofit Leadership and Management at Grand Valley State University. She is currently the Development and Community Relations intern at Grandville Avenue Arts & Humanities. The Heritage Grant has ignited an engaging conversation among these Latino teens about their racial identity while encouraging them to embrace and celebrate their heritage through the arts. The students shaped an environment where they could have an open dialogue about how race, identity, and inequality influence their community and their lives. They learned how to articulate their complicated feelings surrounding race and how they can use the arts to keep this conversation going within their community. Through The Heritage Grant, the teens accomplished three major projects. 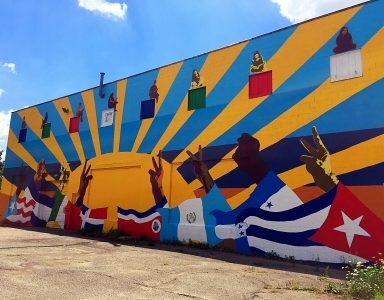 First, they restored a large-scale mural on the side of a building in their neighborhood that reflects and memorializes their cultures. Secondly, they planned and performed Act on Racism Skits that illuminated daily instances of racism they often encounter. Finally, they created a documentary that captured their progress throughout these projects and incorporated interviews with each other about their experiences with racial identity. Because of this grant, the teens learned how to make important decisions that will positively influence their community and how to discuss the affect that race and inequality have in their lives. The teens’ discussions were candid and authentic; introspective and bare; heartbreaking and inspiring. They finally had an opportunity to talk about what hurts. These dialogues developed bonds among teens who had more in common than they realized. These bonds crossed cultural barriers to reveal that these teens were not alone in feeling torn between their racial background and what society has deemed “acceptable.” The products from these discussions (the mural, skits, and documentary), were vehicles through which the teens could safely express the inequalities they face everyday. The teens’ mural, located at 912 Grandville Ave SW. The concept of having the teens themselves establish tangible goals to accomplish gave them a positive layer of momentum and motivation. The collaborative nature of the mural, skits, and documentary encouraged the teens to genuinely connect with one another. Thus, a sense of optimism and harmony formed. The goal of beautifying the neighborhood on a physical level translated into the hope of beautifying the neighborhood on an emotional level—to heal. Residents stopped to thank the teens as they worked on the mural and expressed how meaningful it was to see the community’s youth so eager to learn, inspire, and unify. The mural is an artistic and visible example of the teens celebrating their identities for the entire city to see. It is funded projects like these that illustrate to the teens the positive influence they can have on their community and the fact that each of them matters. The Heritage Grant has invigorated these teen leaders to keep creating and keep being heard. The youth of this and other communities have a lot to say. They just need tools to turn their feelings into actions—or in this case, art.